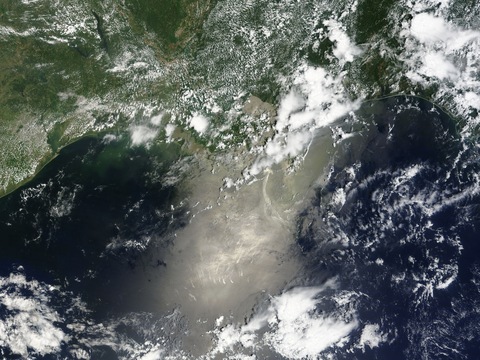 In this May 31 photo from NASA, the oil slick is seen off the coast of Louisiana with a portion flowing south from the accident site. Photo by NASA via Getty Images. As BP presses ahead Wednesday with its temporary fix to contain the massive oil spill in the Gulf of Mexico — one that officials warn may temporarily increase the flow by as much as 20 percent — oil was landing on the shores of Alabama and Mississippi and is nearing the Florida coast. The operation began Tuesday when the company deployed robotic submarines 5,000 feet below the surface to saw through what is left of the damaged well’s riser pipe. The next step will be to lower a tight-fitting cap over the pipe and eventually siphon the oil to the surface. Speaking to reporters on Tuesday, Coast Guard Adm. Thad Allen said that “oil containment, rather than capping the well” is now the mission until BP puts a relief well in place. BP says it could be August until a new well is ready. Meantime, while oil continues to push into Louisiana’s marshes, it has for the first time reached the shores of Alabama and Mississippi. In Alabama, “red-brown oil” hit a small island near the mouth of Mobile Bay, while in Mississippi, Gov. Haley Barbour said a two-mile-long, three-feet-wide strand of crude has been spotted on the barrier island of Petit Bois. Oil is nearing the Florida coast, as well. Officials there confirmed an oil sheen Tuesday about nine miles from Pensacola beach, where the summer tourism season is just getting started. The latest projections say oil could hit there sometime late this week. “With as much as 34 million gallons of oil inking the Gulf of Mexico, ‘Yes we can’ has been downgraded to ‘Will we ever? '” Maureen Dowd says in the New York Times. For the fourth time in as many years, a Japanese Prime Minister has announced his resignation. Yukio Hatoyama said Wednesday he will step down less than one year after taking office. Hatoyama was elected in September, but saw his approval ratings plummet after breaking a campaign pledge to close an American military base on the island of Okinawa. The Wall Street Journal’s Japan Real Time is covering several angles to this story, including potential replacements, the effects on Japan’s global relations and reactions on the web.